'RUT' is an acronym for 'Rapid Urease Test' which a commonly used biopsy-based method for diagnosing Helicobacter pylori (H. pylori) infection. H. pylori is a major human pathogen which can cause progressive gastroduodenal damage. It is a kind of bacteria which is believed to be responsible for chronic gastritis (inflammation of the stomach lining), peptic ulcers, gastrointestinal (digestive) disorders, and potentially gastric cancer. The RUT -- also called the Campylobacter-like organism test (CLO test) or, simply, Urease test -- is a simple and cheap diagnostic test for H. pylori infection. It is a popular diagnostic test because of its rapid and accurate characters. This test can effectively detect the presence of urease enzyme in or on the gastric mucosa. The basis of the test is H. pylori bacteria's ability to secrete the urease enzyme, which catalyzes the conversion of urea to ammonia and carbon dioxide. For establishing the diagnosis of H. pylori infection, the RUT is performed at the time of gastroscopy. To perform this screening test, doctors take a biopsy of mucosa from the antrum of the stomach, and place it into a medium which contains urea and phenol red (or some other indicator). The urease produced by the H. pylori bacteria hydrolyzes urea to ammonia. As a result, the pH of the medium gets raised, and the color of the specimen changes from yellow (Negative) to red (Positive). 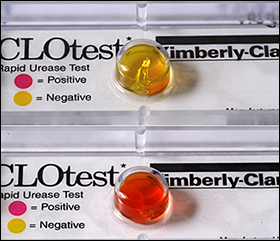 The term 'RUT Positive', therefore, means that the results of the Rapid Urease Test (RUT) are positive. The RUT is generally carried out for patients who suffer from the following two conditions: (i) Helicobacter pylori gastrointestinal tract infection, and (ii) Stomach cancer. According to Ayurveda, the H. pylori infection, for which the RUT is a popular diagnostic test, results from an imbalance of 'Pitta' dosha in the body. The H. pylori infection, as per Ayurvedic experts, is triggered by the onset of 'Amla pitta' --- a health condition associated with acidity. The infection can spread via direct mouth-to-mouth contact between an infected person and a healthy individual, or by consuming contaminated food and water, or living in unhygienic conditions. After the RUT diagnostic test establishes the diagnosis of H. pylori infection, the patients suffering from the infection need to be treated properly, in a timely manner, because the infection can potentially lead to several other health problems. For treating H. pylori infection, doctors generally prescribe a combination of antibiotics and acid-reducing medicines to the patients. Ayurvedic treatment for H. pylori infection involves the use of herbs. There are some excellent herbal formulations offered by Planet Ayurveda herbal manufacturing company which can be extremely beneficial in managing the symptoms of H. pylori infection. These formulations are prepared under the guidance of Ayurvedic experts, and are chiefly aimed at balancing the body's 'Pitta' dosha. These capsules are prepared from the standardized extract of the Bhumiamalaki herb (Phyllanthus niruri). The use of these capsules is very beneficial for treating H. pylori infection as well as acidity, loss of appetite, constipation and other common conditions related to the stomach. Dosage: Two capsules with plain water, two times a day, after meals. Sanjeevani Vati tablets are prepared from a combination of some very potent herbs with proven properties to manage stomach disorders. The herbal components of these tablets include: Amalaki (Emblica officinalis), Haritaki (Terminalia chebula), Vibhitaki (Terminalia bellerica), Shunthi (Zingiber officinale), Pippali (Piper longum), Guduchi (Tinospora cordifolia), Vacha (Acorus calamus), Vidanga (Embelia ribes), Shudha bhallataka (Semecarpus anacardium), and Shudha vatsnabh (Aconitum ferox). The combination of these herbs can effectively eliminate toxins (ama) from the body. Dosage: Two tablets twice a day, with plain water, after meals. H. pylori infection can also be managed with the help of Digestion Support capsules which are prepared from the following herbs: Amla (Emblica officinalis), Haritaki (Terminalia chebula), Pippali (Piper longum), Jeerak (Cymium cumium), Sounf (Foeniculum vulgare), Dhania (Coriander sativum), and Bahera (Terminalia bellerica). The use of these herbs synergistically promotes the overall health of the digestive system. Dosage: One capsule with plain water, two times a day, after meals. These tablets are prepared from some very useful herbal components which include: Chitraka (Plumbago zeylanica),Pippali (Piper longum),Danti (Baliospermum montanum), Sarjakshar (Sodium Carbonate), Shudh Tankan (Purified Sodium Biborate), Shudh Parad (Purified Mercury), andYavkshar (Potassium Carbonate). These tablets can manage H. pylori infection, acidity, and gas-related problems. In addition, the use of these tablets also keeps the digestive system healthy and maintains good appetite. Dosage: Two tablets two times daily, with plain water, after meals. The herbs which are combined for preparing these tablets include: Safed Chandan (Santalum album), Amalaki (Emblica officinalis), Sugandha Maricha (Piper cubeba), Karpoora (Cinnamomum camphora), Daruharidra (Berberis aristata), Khadira Sara (Acacia catechu), Rala (Shorea robusta), and Chandana Taila (Sandalwood oil). These tablets are extremely effective for balancing the aggravated ‘Pitta’ dosha, rejuvenating the digestive system, treating gastritis, keeping the immune system healthy, improving body metabolism, and promoting overall health. Dosage: Two tablets two times a day, with plain water, after meals. This wonderful herbal powder is prepared from the following herbs: Chhoti Elaichi (Elletaria cardamomum), Saunf (Foeniculum vulgare), Bilv (Aegle marmelos), Jaiphal (Myristica fragrans),Dhania (Coriander sativum), andAnar (Punica granatum). The use of this churna is very beneficial in managing H. pylori infection and other problems of the stomach. Dosage: One teaspoonful of the churna with plain water, two times a day, after meals. 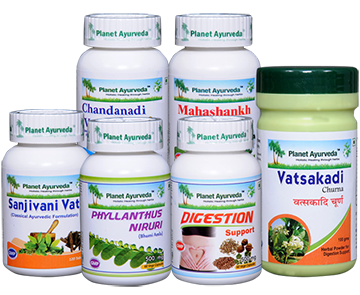 All the above-mentioned herbal products offered by Planet Ayurveda for managing H. pylori infection are completely safe to use, as they are prepared from 100% pure and natural herbs. These products do not contain any chemicals, artificial colors, additives or preservatives.